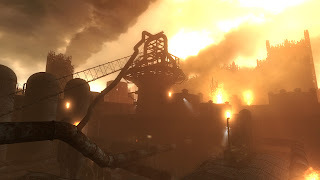 It's a bleaker future than the Penguins without Sidney Crosby in Bethesda's second Fallout 3 DLC release, The Pitt. As you might remember, NGP took a look at Operation: Anchorage back in February and we've decided to keep the DLC train rolling with The Pitt. Descend into Steel Town with me, won't you? One of the issues I had with Operation: Anchorage was the integration of the DLC into the greater Fallout universe. It felt a little too much like a different game using the Fallout 3 graphical assets. Additionally, the combat took centre stage while some of the elements associated with the Fallout franchise like dark humour were somewhat diminished from the main game. The natural question is how did The Pitt address these shortcomings, if at all? The narrative of The Pitt (I confess, my main interest in any game) is stronger than its predecessor. The slave rebellion in which your character may partake, suppress or ignore carries a greater sense of importance to the Fallout world than a mere military simulation (as in the case of Anchorage). The stakes feel higher in the Pitt, and when you conclude the DLC it will likely be with a sense of having impacted the world in a meaningful way, other than some new swag and achievements. While Alaska offered some stunning vistas and rocky mountains for the player to admire, The Pitt gives some up-close looks at what happens when a major city descends into near-madness. It is a city of foundries, ore collection, metal and grime. The Pitt offers the player a chance to profit from or assist those who have been co-opted into rebuilding the shattered city, and the backdrop for this ultimate choice really enhances the experience. All is not perfect with this DLC though, some flaws did appear during my time with the game. For starters, it's short. I'm sorry I bring this up in nearly every DLC review, but I feel like companies are getting a free pass on this. The Pitt is over quickly, just when you start to feel acquainted with the city and the characters it's time to be on your way. Whether you decide to stay longer in search of achievements could add some time to your experience. Additionally, it is entirely possible to complete The Pitt having lost your previously accumulated gear, and I do mean everything. I'm not giving anything away by revealing that you are forced to turn over your weapons, with the implication of being able to retrieve them at a later time. I strongly urge you to do this at your earlier chance, lest you find yourself stripped of all the cool ninja gear available in Operation Anchorage. I was a sad wasteland wanderer on that day. All in all, The Pitt is a transitional relationship, rather than the one-night stand that Anchorage offered up. The 3rd DLC release, Broken Steel hopefully will represent a longer-term union that will leave both parties satisfied. This reviewer will gladly offer up his body for the cause...and hopefully won't get hurt again. Oh DLC...why must you only love me for my wallet?